The term "jack" is particularly common for this stype of connector, which is confusing because in most connections "jack" refers to the "fixed" part, i.e. the connector on a piece of equipment such as a sound mixer where a cable plugs into. The fixed connector is usually female (a hole or socket) whereas the plug is usually male. The terms "jack plug" and "phone jack" are therefore ambiguous, which is why we prefer the terms "TRS" or "TS". In any case these connectors are very common in audio equipment. The original 1/4" size was used in early telephone switchboards and has since become a standard connector for musical and other audio equipment. The jack is available in three sizes: 2.5mm (3/32") , 3.5mm (1/8") and 6.3mm (1/4"). Connectors can be either mono (tip/sleeve) or stereo (tip/ring/sleeve). Some plugs are able to carry more signals for use with camcorders, laptops and other applications. 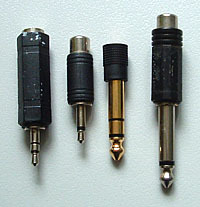 Note: Do not confuse jack plugs with registered jack (RJ) connectors, which are used to connect modern telephone equipment.